The Cornell Institute for European Studies (CIES) Migration series, launched in AY 2017-2018, conceptualizes the migration of not only people, but also images, words, ideas, technologies, objects, information, and food. The series aims to unpack the historical and contemporary relevance of migration in writing global histories and understanding the present, as well as to put Europe in its global context. This will critically acknowledge European countries’ role in the history of modernization and colonization of other countries within and outside Europe, and disclose the region’s character as an immigrant continent and diaspora of various peoples. All the countries in the world operate under the assumption that they have a right to control immigration within their jurisdictions. Most states take this right to be very robust, giving the state almost absolute discretion in determining who to let in and under what conditions. But is this right to control immigration morally justified? Should states have almost absolute control over their borders, keeping out anyone they wish? How does immigration control affect the moral standing of minorities within the country? Should borders be much more open and allow a free, or almost free, flow of immigrants? Do individuals living in distressed or war torn parts of the world have a human right to immigrate to more affluent and peaceful countries? Or is the right to immigration confined to cases of asylum? 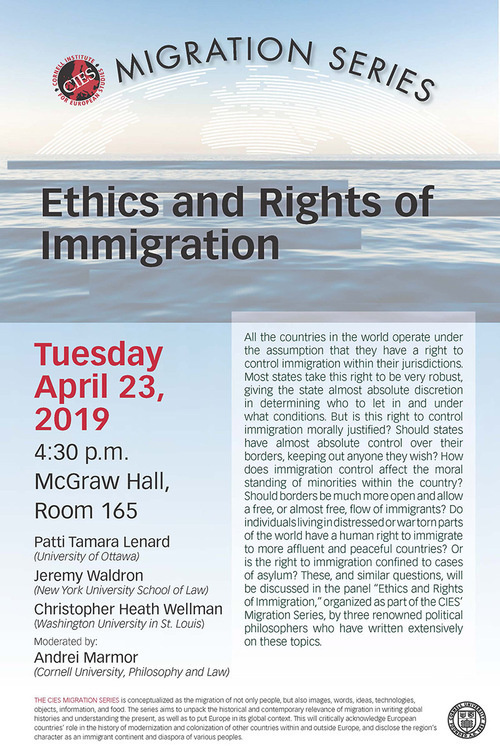 These, and similar questions, will be discussed in the panel “Ethics and Rights of Immigration,” organized as part of the CIES’ Migration Series, by three renowned political philosophers who have written extensively on these topics. Freedom House reports that its global index of civil rights and political liberties has been declining for 13 consecutive years from 2005 till 2018, with 68 countries experiencing a net decline in 2018 alone. Many of these countries are associated with Europe, including Hungary, Poland, Turkey and Russia. The recent threats to democracy, the rise of populism in Europe and elsewhere, UK’s vote on Brexit, and similar trends drive scholars to rethink the strength and future of the European Union. The anxieties about immigration shape both the populist and the protectionist discourses in these countries in different ways. The multidisciplinary panel “Future of EU? Immigration and the Rise of Populism” organized as part of the CIES’ Migration Series brings together scholars who will present a historically and theoretically informed academic perspective on this urgent topic. Renowned experts on the historical and contemporary impacts of radical populism, extremism, immigration, and the role of the state in Europe in the disciplines of political science, sociology and philosophy will share their perspectives on the future of the European Union. Europe has a long history of family separation, which includes both violent immigration control and advocacy against these discriminatory practices. In this panel, scholars who have researched abusive procedures in gendered immigration control in Britain, Germany, Netherlands and the lands of the Ottoman Empire presented their studies. Building on her previous work on the British visa officials in London and the Indian subcontinent, as well as her vigorous campaign against such practices, Jacqueline Bhabha (JD, MSc, Professor of the Practice of Health and Human Rights at the Harvard T.H. Chan School of Public Health and Director of Research at the Harvard FXB Center for Health and Human Rights) delivered her paper “Lessons learnt, forgotten or ignored? Family Separation in Europe and Beyond.” In her talk “Family Separation as a Tool for Genocide: A Look at the 1915 Ottoman Armenian Case,” Lerna Ekmekçioğlu (McMillan-Stewart Associate Professor of History at the Massachusetts Institute of Technology) analyzed the context and consequences of the Ottoman government’s gendered and familial policies during the process of ‘undoing the Armenian family.’ Finally, in her paper “The Trauma of Family Reunification: Hidden Jewish Children in Holland after World War II” Diane L. Wolf (Professor of Sociology at the University of California, Davis) focused on the trauma experienced by many hidden children after war, and how their trauma coalesced around family reunification. Clearly the 21st century will be marked by the increasingly large number of exiles, i.e. uprooted and displaced people who find themselves “erring” within or between states and continents, suffering extreme hardship or facing elimination, and creating imminent “pressure” on states and societies, with moral, economic and political dimensions. This can be addressed from totally antithetic standpoints, leading to a polarization of attitudes with unpredictable results, on which the future of our institutions may well depend. While the origins of the exilic process are complex, and the statutes under which the errands themselves are categorized for administrative and ideological reasons are multiple, a neo-Marxist perspective may try and bring some clarification through the investigation of the “population law” that characterizes contemporary neo-liberal or “absolute” capitalism. The talk wanted to describe and assess the value of this possibility. This presentation addressed extraction, as well as the politics and aesthetics of emergent forms of resistance today. In view of spreading sacrifice zones given over to resource mining, abetted by exploitative international trade agreements and the finance of debt servitude, intensifying the causes of involuntary migration, what forms do the cultural politics of resistance take, and how are artist-activists materializing the images and sounds of emancipation and decolonization? With reference to the diverse artwork of Angela Melitopoulos, Allora & Calzadilla, and Ursula Biemann, which considers geographies of conflict in such regions as Greece, Puerto Rico, and Canada and Bangladesh, this analysis considered a range of leading artistic approaches that adopt an aesthetics of intersectionality that reveals complex causalities and effects, offered a modeling of politico-ecological interpretation, and proposed forms of solidarity with those on the frontlines of opposition. 1968 has come to be seen as the symbolic date for one of the most influential breaks in the history of the twentieth century. Sudden or incremental, young or multi-generational, academic or activist, intellectual or managerial, quotidian or institutional, transformative socially or in political party systems, revolutionary or reformist, and most likely all of the above to some degree in different places, the critical juncture of 1968 and its global legacies are yet to be assessed. In its fiftieth anniversary, this conversational panel with Cornell faculty presented the short and long term impacts of 1968 on societies around the world, as well as its possible reverberations today. The speakers made brief presentations on the history and legacy of this chronological marker in Brazil, Chile, France, Germany, India, Italy, Mexico, Pakistan, Turkey and USA, among other locations. A conversation and Q & A followed to construct comparative reviews of this moment of cultural upheaval, university protests and civil rights movements. The speakers of “Global 1968” collectively illustratd the simultaneity and migration of revolutionary ideas. A panel discussion which addressed Europe as an immigrant continent, and especially concentrated on the relation between immigration and art, by bringing together artists ​and scholars who work on diasporas and migrant art in major European cities. The International Organization of Migration reported that approximately 4000 migrants had died while trying to cross the ​Mediterranean Sea in the year of 2016, and approximately 3000 by the tenth month of 2017. This panel brought together an international group of scholars and journalists who spoke about the historical and contemporary traumatic experiences, such as deaths, accidents, colonization and forced migrations, suffered by those crossing the Mediterranean. Panelists exposed the extent of looted archeological objects across seas; discussed the violence of France’s spatial practices during the Algerian Revolution on both sides of the Mediterranean; ­ reflected on the main causes of people's drowning in recent years; and focused on the maritime arena as a mobile border that envelops migrants seeking to navigate structural injustices as well as ideological and violent conflicts. While our age is often named as the visual century, the historical relevance of image migration is relatively under-studied. The “Migration of Images” panel brought together scholars who spoke to the visualization of Muhammad in art books throughout Europe across centuries, geopolitics of exhibiting paintings and objects, and Bauhaus in India. Anxieties over the issue of migration and hostility towards immigrants seem partly related to automation and fears of unemployment. The panel addressed the relationship between migration and technology (part of “Critically Now” series, AAP). Author of a seminal book on exiled scholars (Auerbach in particular) from Germany during National Socialism, and currently active with exiled scholars in Germany, as well as the founder of the Exile Academy, Kader Konuk addressed the historical and contemporary dimensions of violations of academic freedom.